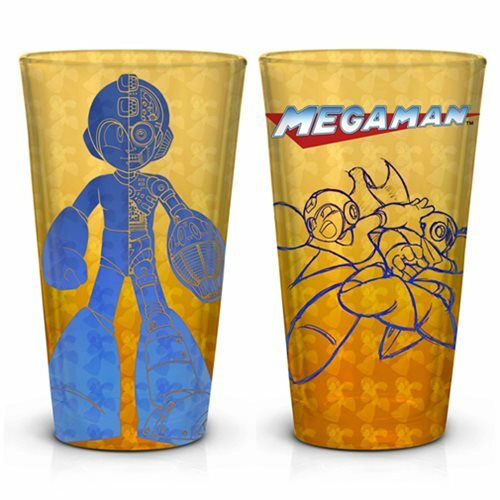 Cups, wallets and things in between, here's the latest batch of licensed Mega Man goods that aren't figures. Some of this stuff was first seen at E3 last week. No sign of that hoverboard yet, though! They all look neat, especially the pint glasses and Legacy Collection 2 shirts. Never thought glassware would utilize gradients and artwork that well. I'd especially want those to come my way, but I don't really get why you'd want a water bottle that big in glass form. Whoa, where's the art on that cup from? The Protoman/Megaman side. I don't think I've seen it before. Protodude, if you happen to have that art, do let me know where it's from. Thanks. It's from one of the Complete Works games. I know I have a transparency somewhere. I'll let you know.